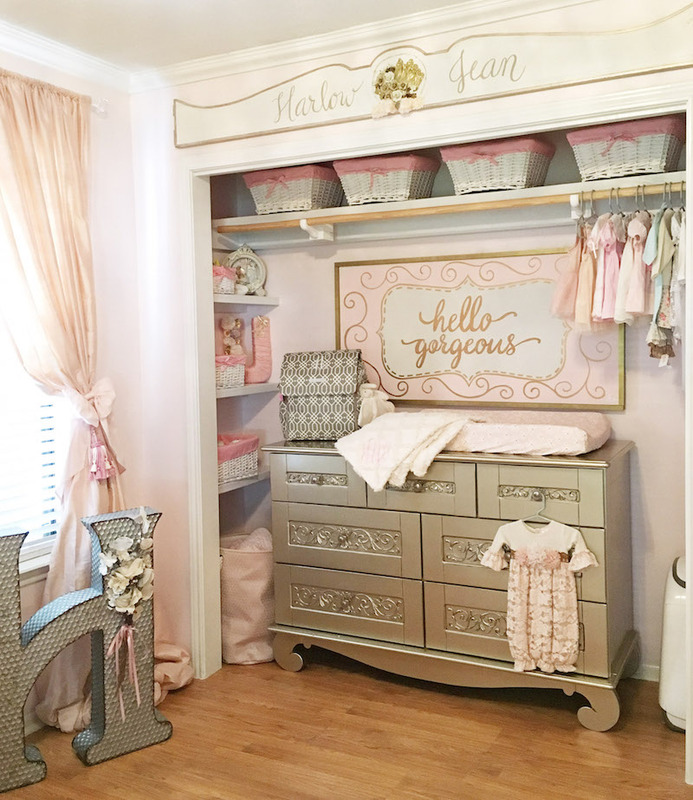 Rose Gold and Blush Nursery - Happily Ever After, Etc. 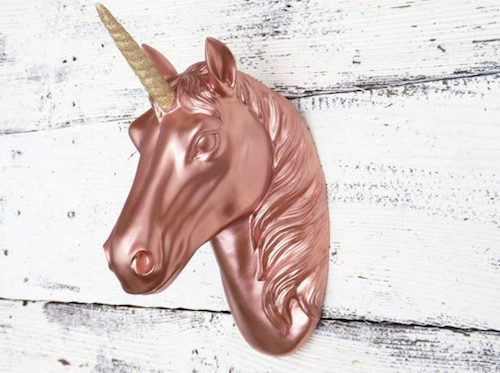 Rose gold is the trend of the year and I am definitely firmly on the bandwagon. 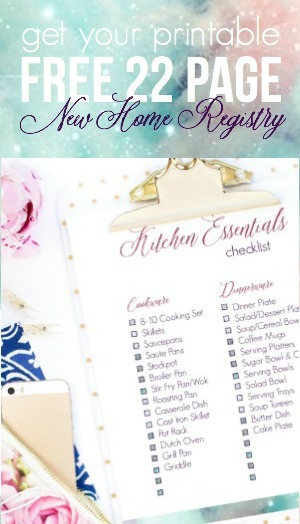 I absolutely love the sheen… it’s the perfect combination of sophistication, elegance and whimsy. I mean even though we just finished our kitchen renovation I’m kind of digging the rose gold faucet I saw in a mood board on instagram. So these days everything I’m planning has a touch of rose gold… including all of my ideas for a sweet rose gold and blush nursery. See my best friend is having a little baby girl in a couple months (little baby Elizabeth Rose!) and my cousin just had a baby girl a month ago (Addision). How awesome are those names?! So baby girl nurseries are on the top of my mind! One of my co-workers is having a baby and I’m hoping it’s a boy so I can start dreaming up little boy nurseries too… balance out my brain :). 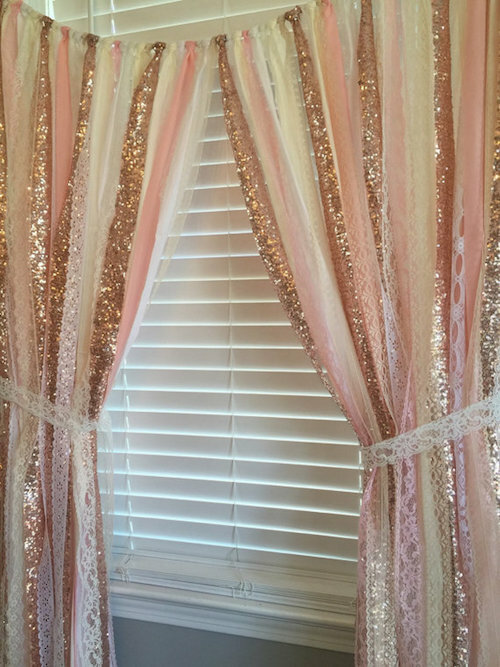 In the meantime let’s look at all the pretty inspiration for a sweet little rose gold and blush nursery. 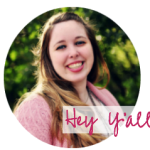 I started by grabbing a cozy blanket, turning on Gray’s Anatomy and opening Pinterest! 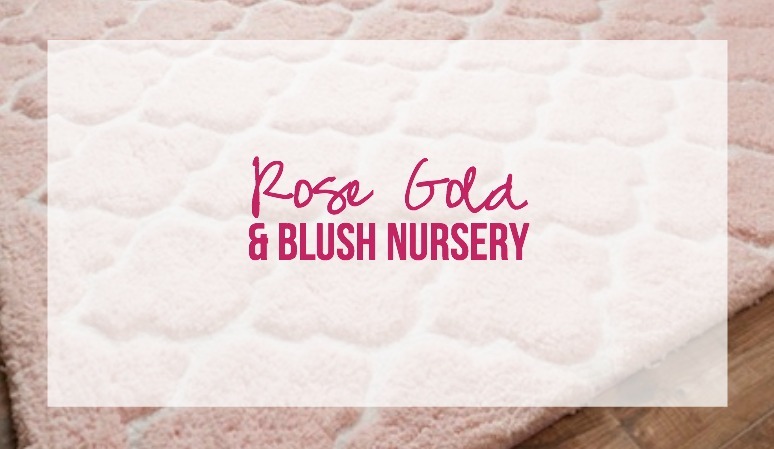 Surprisingly there were only a few rose gold nurseries to be found… which is kind of amazing! That means we have a clean slate to build whatever our little hearts desire! Of the inspiration I did find I’m loving a few specific things. That canopy… oh my gosh! Every little girl needs a canopy. They’re like magic! 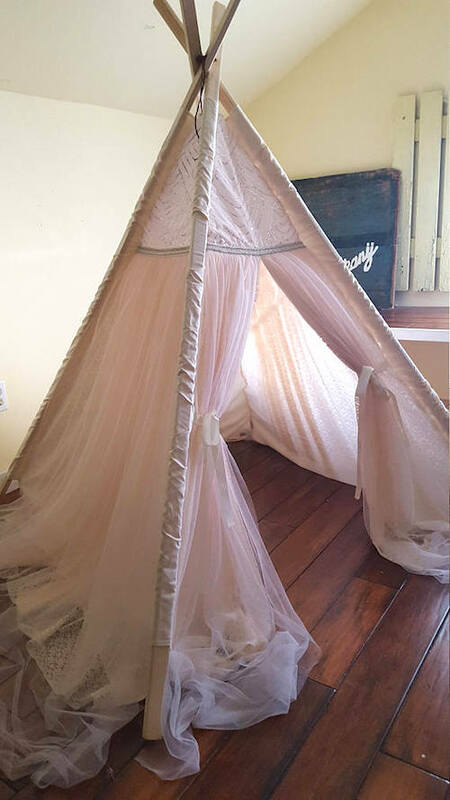 I had one over my bed when I was a little girl and it made me feel like a fairy tale princess so I have to recommend them for all little girl rooms. 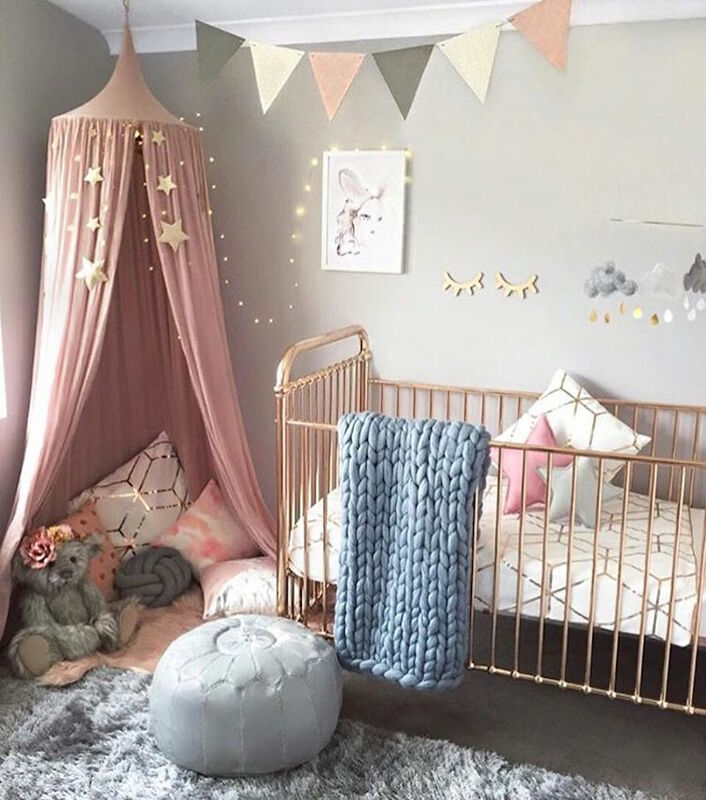 The second thing I’m loving is that rose gold crib! Speaking of rooms… this little closet is kind of it’s own room! I love having the closet open to the room in a babies space… those little clothes are so cute you don’t want to hide them away! Plus it gives you more usable space… like this changing table. Love love love. 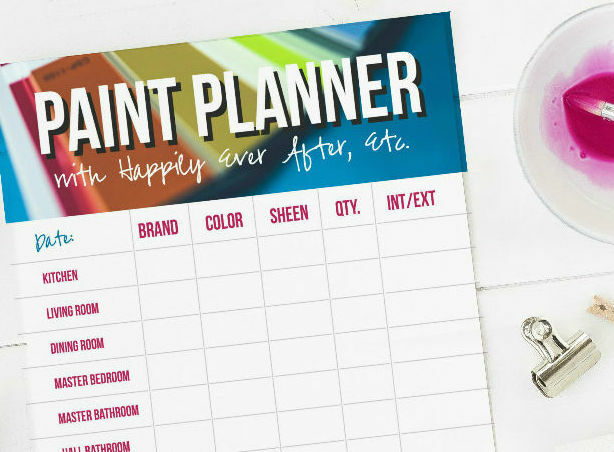 So now that we’ve found a bit of inspiration let’s look at the products that will pull the entire room together! It’s beautiful and whimsical and would be the perfect place to curl up with little miss for story time… and later it will be her perfect hideaway! These are gorgeous! 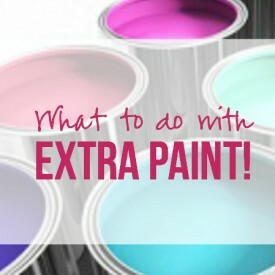 They would look beautiful on a white dresser… or a gray dresser! Something neutral so the knobs pop. Plus with all the rose gold you’ll need a big piece to balance out the room so a neutral dresser would be perfect! 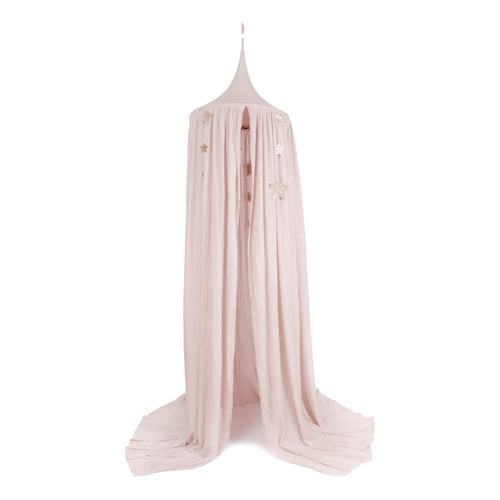 Paired with that canopy this crib could be a real show stopper. It’s the perfect modern take on a classic baby crib. 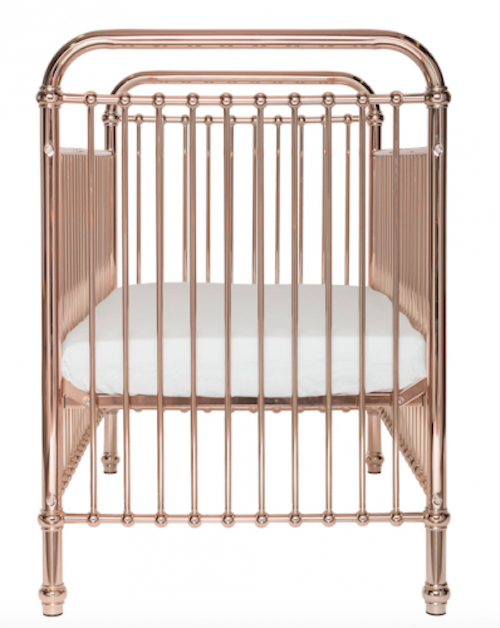 I love how it nods to the cribs our grandparents used while staying true to the rose gold trend. This little deer is the perfect combination of rose gold and white. 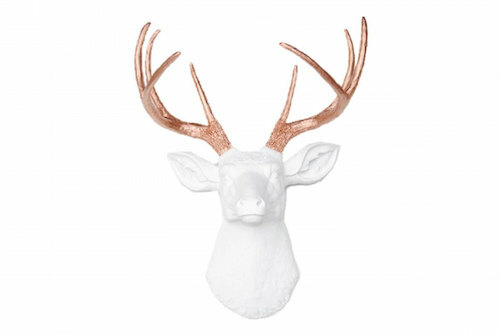 With a pretty blush floral wallpaper statement wall this little deer would be the perfect addition to any wall gallery. 5. 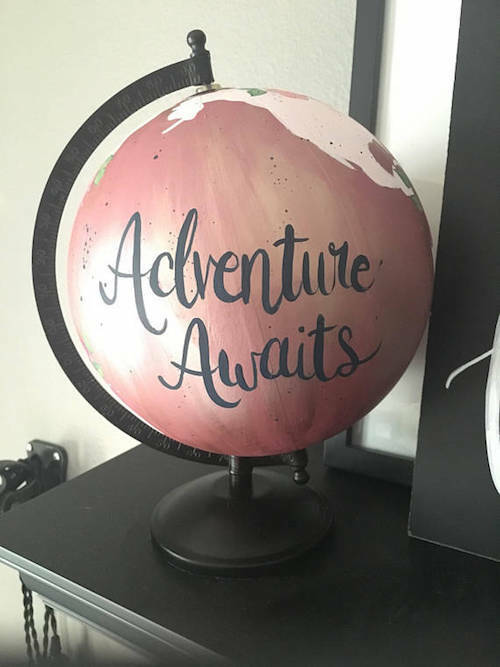 Blush Globe… Adventure Awaits!! 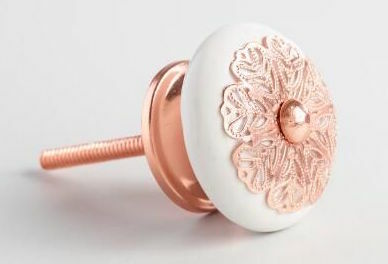 This little globe is hand-painted which would be the perfect addition to a white dresser with rose gold knobs. See how we’re layering all these items together? I love the lettering on this little guy but I’d probably paint the base white to feel light and bright. 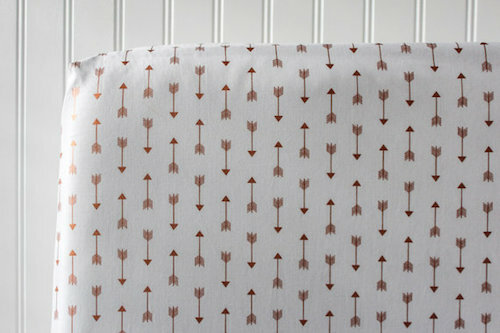 These little arrows have a slightly metallic sheen which would pair beautifully with a rose gold sequin bed skirt and blush pink bedding. Especially with the gorgeous blush crib below.. combining new modern sheets with a soft sweet crib is the perfect balance. 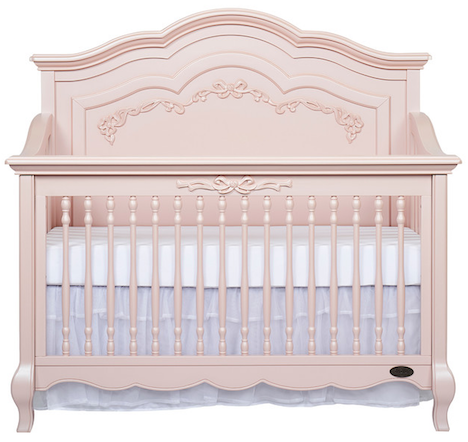 I’m not sure which crib I love more… the gorgeous rose gold crib above or this curvy blush beauty. 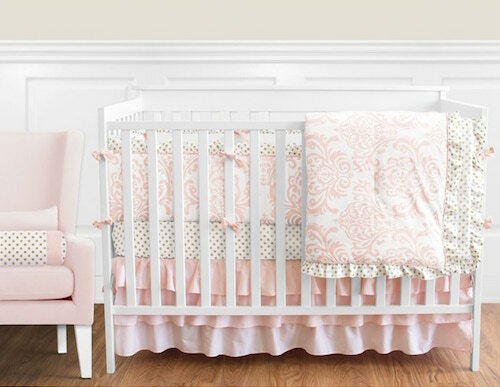 If this little curved crib came in a rose gold finish it would be the best. crib. of. all. time. But in lieu of rose gold blush is the perfect alternative. It coordinates well with rose gold as well… because a room full of only rose gold would be way too much. It needs to be balanced with blush and gray and white. You can completely ignore the crib on this one… we’re looking at that beautiful bedding! 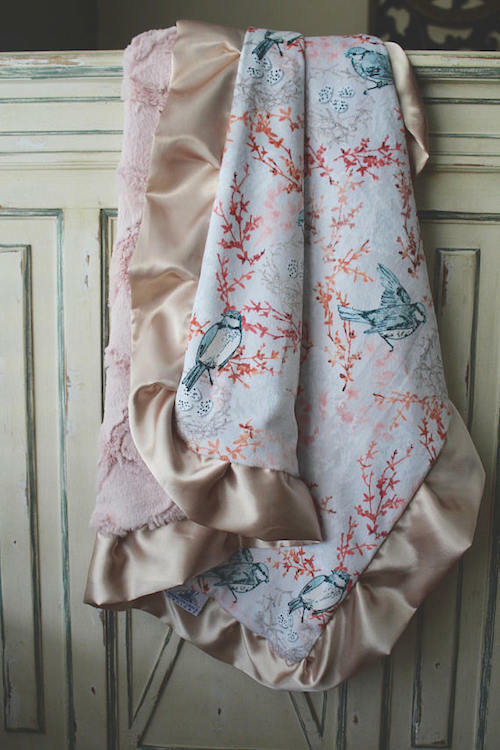 It has a traditional feel with the damask but it’s just so soft and feminine. Paired with the new, trendy rose gold a few traditional pieces is the perfect finishing touch. The curves on this font are absolutely beautiful… not to mention the metallic sheen of the rose gold. This would be beautiful over a sweet baby’s crib… especially with a longer name that will take up a bit of space! My best friends baby will be Elizabeth Rose and my cousins sweet baby girl is named Addison. Such sweet names for a gorgeous name over a sweet babies bed. 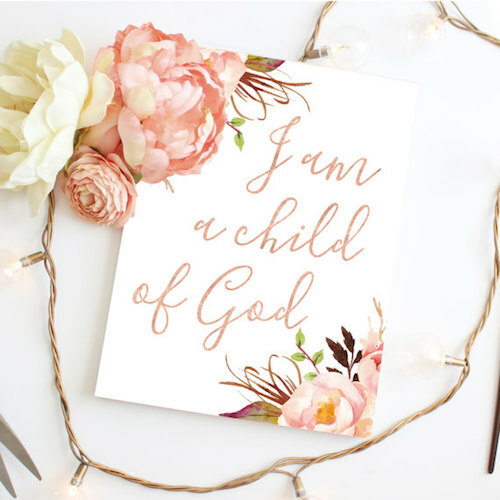 There is a variety of gorgeous rose gold (or blush) printables out there! They would look pretty in a frame or on a clipboard or even propped up on a shelf. 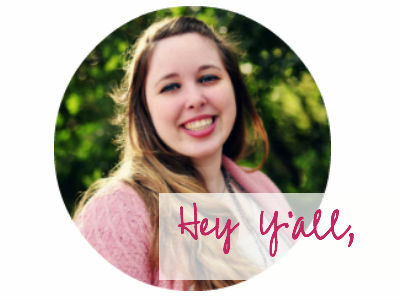 I know what you’re thinking… why do I need a cake stand in my babies nursery? So many reasons! Mainly for a pretty little height difference. This little guy would be perfect on a bookshelf or dresser to add height to a display. Plus it’s gorgeous! 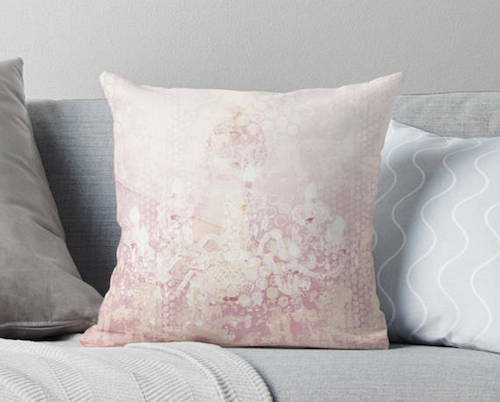 This little chandelier pillow would be perfect for your little bling princesses nursery… not in the crib of course. It would be the perfect accent in a reading nook or sitting in a rocker though! I am absolutely loving the canopy trend that’s circulating right now. 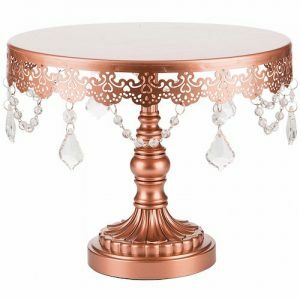 It’s the perfect accent over a rose gold crib or in the corner for a reading nook. 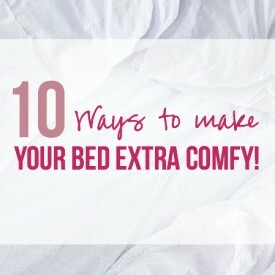 Especially with an extra fluffy flokati rug underneath and a few throw pillows! These ribbon banners are the perfect pop of whimsy. 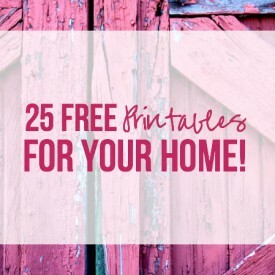 They’re handmade and come in all kinds of different sizes so you could use a short one in a wall mural or as a crib banner… or even as an accent for curtains! 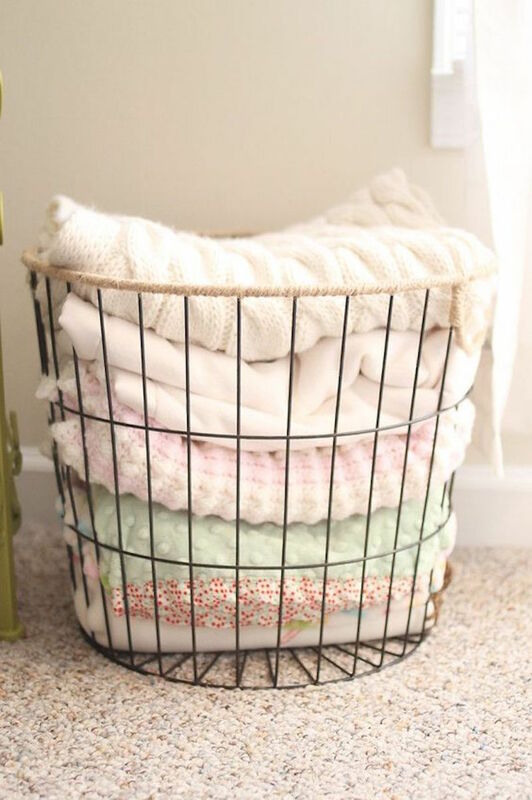 Every baby needs a blanket and if your baby is like most they’ll have several (it seems like an easy gift to give and everyone loves them!). This one is soft and plush on one side with a silky smooth edge for close to baby. Plus it’s gorgeous… this is what newborn photos are made of. There are so many beautiful mobiles out there that I couldn’t pick just one! If I could combine all three of these I think it might be the perfect option! 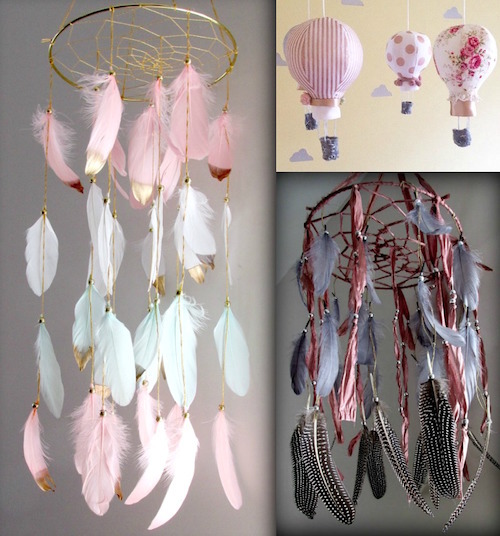 Gold dipped feathers, dark blush strings and hot air balloons! Rose. Gold. Unicorn. This is literally the best thing ever! 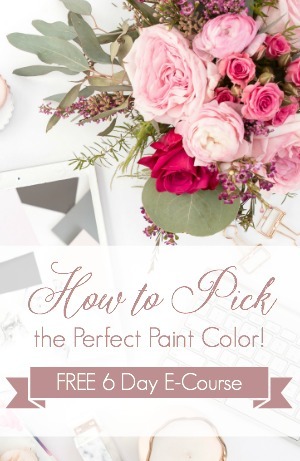 It would be so sweet and whimsical in a photo gallery for a little girls room… especially wreathed with a gorgeous set of white, blush and green (or blue) flowers! The best part of a babies room? 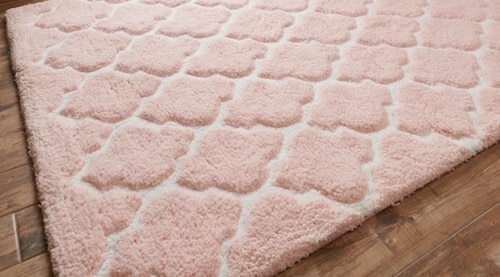 A soft cushy plush rug underfoot. It’s perfect for those long nights pacing with a crying better and even better for mornings playing with blocks or learning to crawl. I love the profile of this one… it looks super cushy! 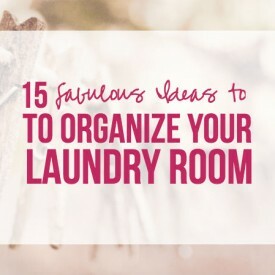 I like your most of the ideas which will look great in my baby room.